Cats and dogs. Truckers and bikers. Leather and synthetic. Usually, these things are in opposition, but every now and then they come together in the spirit of peace and harmony. River Road's luggage liners bring the beneficial attributes of modern synthetic materials to your leather saddlebags, but tuck away and are your hidden arsenal against the elements. Hey, just because you're willing to use textile bags, that doesn't mean you're willing to admit it. Constructed of water resistant materials, River Road's liners are 22 inches wide, 10.5 inches high, and 14.5 inches deep. These will fit nicely in slanted bags with the aforementioned dimensions. 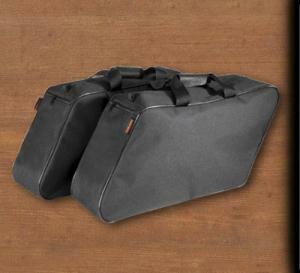 A 2-way zipper lets you open these any way you find convenient, and interior side and lid pockets give you the organizational ability that's usually lost on those leather buckets we call saddlebags. A one-year manufacturer's warranty lets you take stock in the quality, and the fact that they're safe behind the leather means they'll last far longer than that. All this talk about how your leather protects these liners doesn't sit so well, so I can tell you that they protect your leather just as well. There's no real reason to pick up a set of liners if you have high-end bags. The main failing of River Road's liner setup is that you only need it if your bags are cheap, or old and crumbling like mine. In that case, at $30, they're cheaper than a new set of leather bags and will let you keep the set to which you may have grown so irrationally attached.